As a member of several historical-reenactment Facebook groups, I see a lot of people post a photo of cloth they've bought or are thinking of buying with a question about its suitability for a certain era. And so I thought I would write up a guide to give seamstresses more confidence in choosing a fabric, and perhaps help prevent people from buying something too modern and only discovering it once they get home. Note: you can of course use anything you want. You can make a spencer and petticoat out of a Hello Kitty print, if you like, and actually that would be pretty fun. Please see this guide as a helpful aid for those aiming at accuracy, rather than a prescription. Let's start with the easiest category: white cotton. The simplest way to make sure that your fabric is accurate is to pick a white cotton at either end of the spectrum - very light and smooth, or completely solid and with some body. With the lighter, sheerer cottons, you can also use a woven check or stripe. 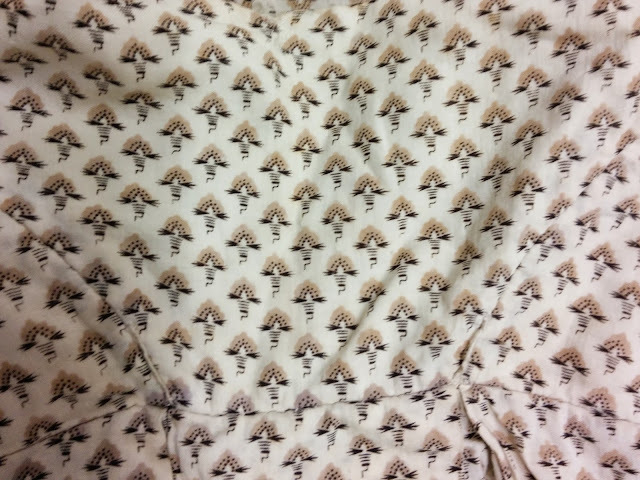 Moving a little more into the interpretive side of things, what about whiteworked cottons? 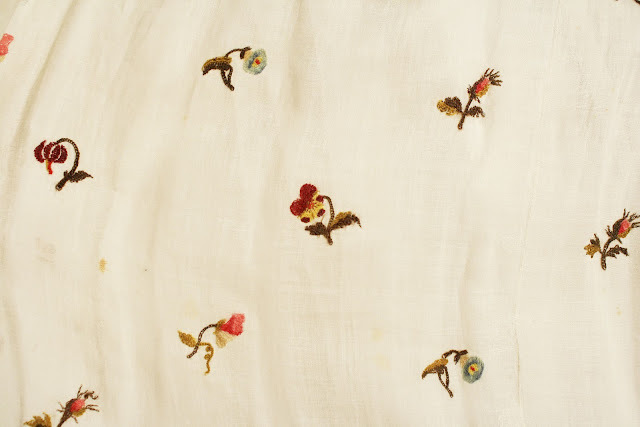 You find gowns made of muslin that were embroidered on the bolt (as opposed to being embroidered after the dress was made up) fairly frequently, especially in the earlier years of the period. Sometimes the motifs are spread apart and sometimes they're very close together. Non-white and multicolored embroidery were also used, but a) less frequently than whitework and b) mainly in the very beginning of the long Regency. Metallic embroidery is seen longer, but was also more expensive. All embroidery that's not whitework will draw the eye, so the machine factor is much more important. Cotton prints are very frequently used, but are really the hardest to get right. You can get them cheap, sometimes for just a few dollars a yard, so it seems like a good deal, but the fact is that very few quilting cottons are really correct. My recommendation is to go with a plain muslin or a silk: yes, taffeta costs more per yard, but if you get a 60" wide piece you don't need very much of it. Still willing to look for really accurate prints? Okay! The main thing to look for here is density. Single repeated motifs are small, without too much space between them (especially earlier in the period), and set into clear diagonal rows. More intricate patterns are often very dense; delicate ones still give the impression of covering the ground. 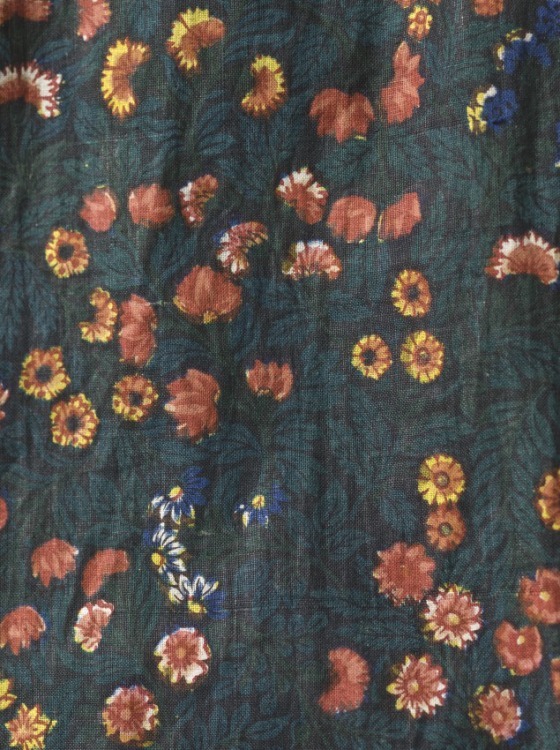 What makes this difficult is that modern prints tend to be wrong on both counts: either larger motifs that are spaced farther apart, or more complex prints with too much space inside them. The other hard thing about choosing prints is that, when you get down to it, the motifs aren't easily categorized. No, the Art Deco movement didn't happen until the 20th century, but you do often see prints that are more stylized or geometric than naturalistic. The gut reaction that a print looks too modern to be from this period is not always useful. I'm being kind of vague here, in part because I don't consider myself a prints expert (due to the comparative lack of extant cotton gowns, you have to spend a lot of time studying quilts as well). There are very good books that can teach you the specifics of dating prints and knowing what exactly prints in a given period looked like - I recommend them if you're serious about trying to get authentic ones. Duran Fabrics makes perfect reproductions, which are expensive, and William Booth, Draper also sells them as well as other good repros. You can even use Spoonflower to reproduce an historic print yourself as well, although I'm not sure what's required there, tech-wise. Cotton bobbinet in a fine gauge with a fine thread, preferably in a color other than optic white, could be used for a sheer overdress. Silk net was more common in the period, but much less common today. Regarding cottons dyed solid colors: I'm sorry, but they aren't a good choice. Logically, it seems to us that dyed cottons would have been easier to make and therefore more prevalent than prints, but it doesn't appear to be the case. Extant pieces and written records do not show solid-colored cottons being used unless they have an interesting weave structure. Solid-colored silk taffeta, however, is a strong possibility and one of the safest choices. The only downside when it comes to choosing a taffeta is that modern taffetas are so often shot with black, which was not as common in the 19th century. (That is, they used shot silk, but black was not the most common second color.) They're also on the heavy side, and tend to be slubby. Even our good taffetas are often not as smooth as historical ones, though, so I would recommend avoiding the truly obvious shantung dupionis but not worrying too much over this otherwise. Silk satin appears, from the magazines, to have been very fashionable, turning up especially frequently as a slip beneath a gauze, crape, or net overdress, or as a dress trim or bonnet. However, satin of the period is generally fairly light - somewhere between modern satin and charmeuse. So this is a tricky area. I would recommend either a very soft satin or a flatlined charmeuse. Silk crape, as mentioned above, was often used for overdresses. It's also in a tricky area, being more translucent than modern crepe but less sheer than chiffon. - Striped silk. This could be either subtle stripes made with different weaves (satin and taffeta are the most commonly found today), or actual colored stripes. Many examples can be seen here. Striped Regency gowns tend to have either narrow stripes alternating with wider ones or equal ones of a mid-sized or narrow width, although there are also more complex examples. There are few wrong answers when it comes to stripes, except that they shouldn't be too wide. - Velvet. Velvet was most common in solid colors. Very simple. 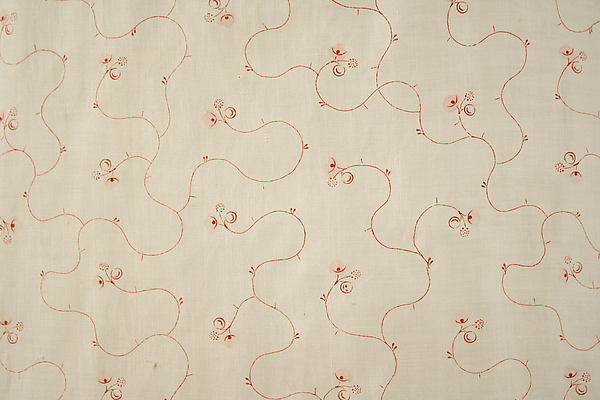 - Figured silk, by which I mean silk (usually sarcenet) with small motifs woven into the fabric. The term was used for figuring of the same color as the silk, as well as brocading. The motifs generally follow the rules of prints. These are more frequently and affordably found today in synthetics. Using a synthetic fabric in general is up to you. They can melt when exposed to flame (but in an evening dress, you are less likely to come into contact with fire), and they can be hot, but sometimes there are weights or weaves of "silk" that can only be found reasonably in synthetics. I suggest steering clear of them, but that's because I love dancing. If using wool, one must be sure to find a cloth that's light and smooth enough to drape well - not the heavy stuff. In terms of patterning, the same rules as cotton apply, but wools were produced in solid colors. Merino is what's usually mentioned in fashion periodicals, but cashmere was also widely used. Yes, we do all know of the gowns made of cashmere shawls, with a border at the lower edge and sometimes around the neckline, but clothing was also made from bolts of cashmere. There is also mention of wool crape for both evening and morning dress. Now, this is by no means complete. A complete list would be a book, but this is hopefully enough to get you started, and help you figure out what to look for before you buy. Did someone say "book"? 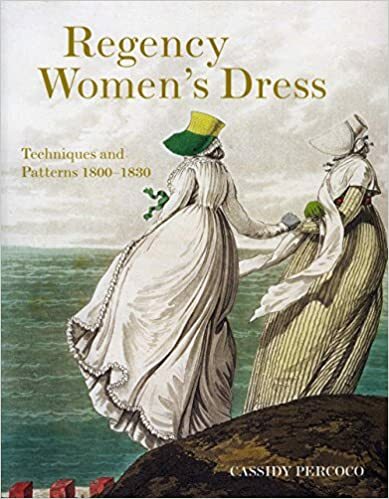 I'm not sure if you heard, but my pattern book, Regency Women's Dress: Techniques and Patterns 1800-1830, is out on Amazon and at other retailers! It's packed full of all the patterns you need to create a wardrobe spanning the full Long Regency period, taken from garments in museums that are off the beaten path. If you have seen it, please consider reviewing it on Amazon! Very helpful and inspiring! I noticed that all the examples of striped silks above are symmetrical. Was that the norm during the Regency? Today, it seems that complex stripes are often asymmetrical. Very helpful indeed. Thank you very very much! Regarding solid colored cotton gowns, you are absolutely right in that they are incredibly rare! Cotton fabric did not take dye well in the period since this was before the process of Mercerization was invented, which makes the fibers more willing to accept color. Prints, plaids, and stripes hold discoloration much better. Interestingly, however, there are records of women over-dyeing old white gowns with color in order to reclaim the dress after staining or discoloring. Cassandra Austen, sister of Jane Austen, sent her old white gown to be dyed blue and it ended up falling apart in the dye pot. I used a similar technique when I re-made an old gown of mine in striped muslin. So there are instances, but as you said, very rare! By the way, I love your book, I can't wait to see what else you have to contribute to our community! Cheers! Sorry if I sound like a know-it-all, I just really love sharing research! !